IMAGE: A unique object called HLX-1 (Hyper-Luminous X-ray source 1) is now the only reliable candidate as the intermediate-mass black hole. The term "black holes" was first used in the mid-20th century by theoretical physicist John Wheeler. This term denotes relativistic supermassive objects that are invisible in all electromagnetic waves, but a great number of astrophysical effects confirms their existence. There are two basic types of black holes known to scientists according to observations: supermassive black holes and stellar-mass black holes. It is generally believed that stellar-mass black holes are formed in the end of the evolution of massive stars, when stellar energy sources are exhausted, and the star collapse due to its own gravity. Theoretical calculations impose restrictions on their mass to the extent of 5-50 solar masses. It's less clear how supermassive black holes come to existence. Masses of these black holes sitting in the center of most galaxies range between millions and billions of solar masses. Quasars, the active galactic nuclei, are supermassive black holes observed by astronomers at high redshift. It means that these giants existed in the first few hundred million years after the Big Bang. Ivan Zolotukhin, who works at the Research Institute of Astrophysics and Planetology (Toulouse), said: "The astronomers look for black holes of intermediate mass, because no black hole that weighs a billion times more than the Sun could have been formed without them in just 700 million years." It is believed that the first generation of stars did not contain metals and, therefore, their masses could have exceeded that of the Sun hundreds of times, and in the end of their evolution, they could become much more massive black holes than those observed today. These black holes merged into formation of thousands of solar masses, and further inclusion of galaxies and the accretion of matter led to the formation of supermassive black holes. 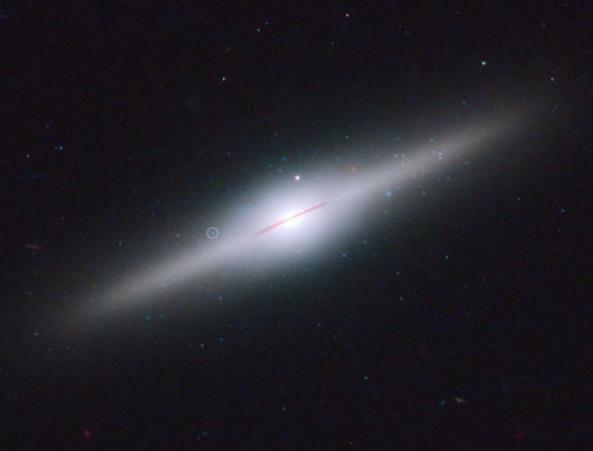 Calculation models of hierarchical galaxy buildup have shown that there should have remained a small number of these intermediate mass black holes astronomers are looking for. A small number means about hundred pieces per a galaxy similar to our Milky Way. They should fly somewhere high above the galaxy plain because while merging black holes acquire a huge impulse that sometimes can throw them out of the galaxy. About 10 years ago, the researchers were looking for such kind of holes (thousands of solar masses) among the heavy stellar-mass holes and the light supermassive ones, but nothing lighter than 500 thousand of solar masses has been found. The paper was published in 2009 by astronomers from Toulouse, who in the course of a search for neutron stars in our galaxy accidentally found a bright X-ray source close to the galaxy, located in the distance of 100 Mpc from Earth. Luminosity evaluation showed that the mass of the object is about 10 thousand of solar masses. It is most likely that it shines due to the overflowing of matter into a black hole from a single star. A unique object called HLX-1 (Hyper-Luminous X-ray source 1) is now the only reliable candidate as the intermediate-mass black hole. Many astronomers were sure that this object is unique, and there won't be any similar to this. At the same time they didn't take into consideration that this object was found by chance, and in the catalog of sources covering only 1% of the sky. "I supposed that such objects should appear much more often, and we have proposed a method of large scale search", said Zolotukhin. The idea is to compare the objects from the wide-scale redshift survey of galaxies (SDSS) with the objects from a catalog of X-ray sources. "I suggested looking around galaxies for millions of X-ray objects with luminosity exceeding a certain value," the author explained. Having applied the developed algorithm to both catalogs, the astronomers were able to find 98 objects, among which at least 16 must be associated with their galaxies. "These are the best candidates for intermediate-mass black hole. We have shown for the first time that a new type of hypothetical intermediate mass black holes (with masses from 100 to 100 000 of solar mass) not only exist, but also exist in a population. In other words, these objects are not unique, there are lots of them", clarified the author of the paper published in The Astrophysical Journal: http://iopscience.iop.org/0004-637X/817/2/88. The methods of the Virtual Observatory were applied in the research, and all the conclusions were obtained exclusively with the use of publicly available data and, therefore, can be confirmed from any computer with Internet access. Moreover, the authors used a new site to access the data of the XMM-Newton observatory. "The uniqueness of this web application is that for the first time in international fundamental science such a complicated project is made specifically for scientists by volunteers – highly skilled programmers, who, while working at the best IT-companies in Russia, devoted their free time to this web page. They are Alexey Sergeev, Askar Timirgazin, and Maxim Chernyshov," told Ivan Zolotukhin, "Many of my colleagues and I are still impressed by their work. The astronomers around the world can now enjoy the unique features of the site, and many discoveries can now be done directly online!" According to Zolotukhin, the current publication presents a series of studies based on this website. "It is important that thanks to simple and clear design scientists from other fields can now enjoy specific X-ray data," said the scientist. This study essentially opens up the possibility for the search of intermediate-mass black holes. Since the researchers suggested more than a dozen of such candidates, it is expected that in the years to come they will be reliably confirmed with optical spectroscopic observations. In the near future it is expected to search for them by the six-meter telescope of the Special Astrophysical Observatory (Russia) as well. "If there is at least one confirmation – it will be published in Nature, and astronomers immediately will rush to explore these 98 objects," said the author of the work. The candidates were found only in 2% of the sky, so astronomers hope to launch a Russian-German space telescope "Spektr-RG" in 2017. The researchers hope to discover hundreds of objects like HLX-1 through a deep X-ray view of the sky obtained by the means of this telescope.